Last night after our group meeting, 8 of us went for a walk to the Puerta del Sol and then had a tapas dinner at a cosy little place called Cuervos el Secreto (or something similar meaning The Secret Cave). The food was delish! We all shared 3 salads (1 green salad, 1 tomato & anchovy salad, none of that for moi, and 1 red pepper & basil pesto salad), bread, cheese, 2 meatball stews (the best dish of the evening! ), grilled potato and a variety of kebabs with Sangria to wash it all down. This morning we were up early and got on the bus to Salamanca. It was a 3 hour trip and we arrived around midday. We had a little free time after we had arrived and checked into Hotel Condal, then we went for lunch in the Plaza Mayor. I had some yummy paella and red peppers stuffed with cheese & ham. After lunch we wandered to the Casa de las Conchas, an old palace (now library) who's exterior is covered in approximately 400 stone shells, on to the Cathedral Nueva and then over El Puente Romano (the Roman Bridge) which was apparently built in around 89 AD. The rest of the afternoon was spent dipping pastries into thick hot chocolate, commonly known as Chocolate con Churros. 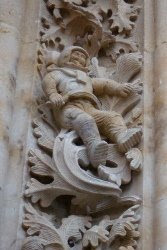 And then I went in search of "The Astronaut in the New Cathedral (La Nueva)". It was damn tricky to find, I wandered around the entire building staring at each doorway's carvings. Eventually I gave up and asked someone at the Cathedral viewing desk (for people who want to go up to the bell tower for a view over Salamanca) who directed me to the relevant doorway. By then there were a bunch of other people looking too which made it quite simple in the end. So funny! Side Note: After having looked it up online when I got home, I found out he was probably carved by one of the restorers in 1992. Apparently there's also an ice-cream cone somewhere on the New Cathedral, but I only found out about that one when looking online for the above link. Not that I knew to look for the Astronaut before I went either tho, I just saw him just on one of the postcards for sale after arriving in Salamanca. After a bit of a relax at the hotel, we met up to go out for dinner, which didn't really happen. Instead we went out to drink (most of us were full from the big lunch). I started with a glass of Taurus wine (simply had to try it since I am in bullish Spain and a Taurean myself). Then we headed to a fab little bar in the Plaza Mayor called 23 that let you have 1 tapas with every drink ordered. What an ideal way to dine! Chocolate con Churros... hmm delicious! I love this, I feel like I'm in Spain with your mention of sights and food. And since I so desperately want to go traveling, this is great until I can do the real thing! That astronaut is hilarious! Way to go to whoever carved it. Philly, you should be writing for www.nextstop.com.